There are 15 Assisted Living Facilities in the Easley area, with 5 in Easley and 10 nearby. The average cost of assisted living in Easley is $3,123 per month. This is lower than the national median of $3,346. To help you with your search, browse the 111 reviews below for assisted living facilities in Easley. On average, consumers rate assisted living in Easley 3.9 out of 5 stars. Better rated regions include Anderson with an average rating of 4.0 out of 5 stars. Caring.com has helped thousands of families find high-quality senior care. To speak with one of our Family Advisors about assisted living options and costs in Easley, call (855) 863-8283. Southern hospitality and the natural beauty of the Blue Ridge Mountains appeal to some residents in Easley, South Carolina. Just over 24 percent of the population in Easley, South Carolina is age 60 or over. Some of these individuals live in the five assisted living centers here, and there are 45 similar facilities in surrounding areas, including Greenville and Seneca. 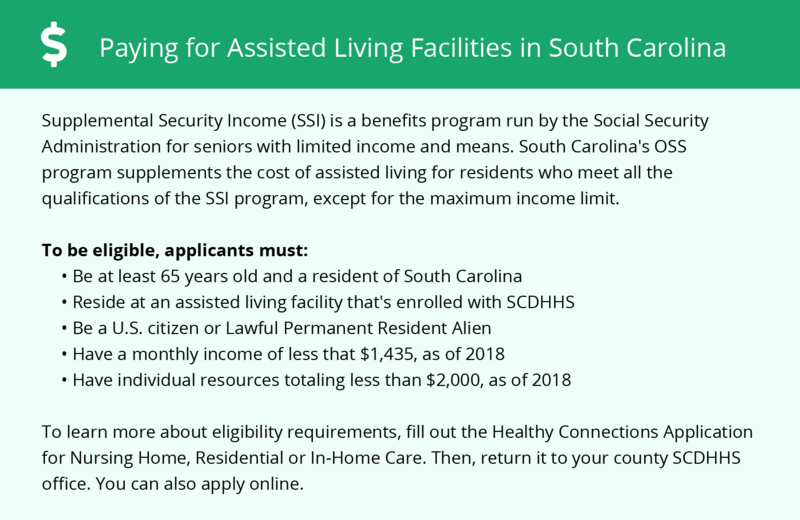 Assisted living facilities are formally known as community residential care facilities, which are governed by the South Carolina Department of Health and Environmental Control. Mild winters and warm summers in Easley may appeal to some senior citizens. There are around 222 sunny days per year, which is more than the 205 average for the country. The average low in January is 31 degrees Fahrenheit and the city only gets about one inch of snow per year. Summer temperatures top out at around 89 degrees Fahrenheit in July. There is a chance of hurricanes during the June through November season. The air quality in Easley should be suitable for the average senior citizen. It is on par with the national average air quality of 58. Some seniors might find Easley to be financially pleasing. The city has a cost of living index of 93.3, which is slightly below the national index of 100. The downside to this is that the health index, which indicates the cost of health-related expenses, is slightly higher here with a score of 106. Senior citizens may not feel safer in Easley than in the average U.S. city. The violent crime rate in the city is 37.8, which is a bit higher than the national average of 31.1. The property crime rate here comes in at 66.2, which is also higher than the national average of 38.1. The Fine Arts Center of Easley has a variety of activities that senior citizens can enjoy. Music lessons are one option. There is also a theatre company for children and adults alike. The Easley area is home to world-class medical facilities, including Baptist Easley, in the event of medical emergencies or illness. Assisted Living costs in Easley start around $3,123 per month on average, while the nationwide average cost of assisted living is $4,000 per month, according to the latest figures from Genworth’s Cost of Care Survey. It’s important to note that assisted living rates in Easley and the surrounding suburbs can vary widely based on factors such as location, the level of care needed, apartment size and the types of amenities offered at each community. 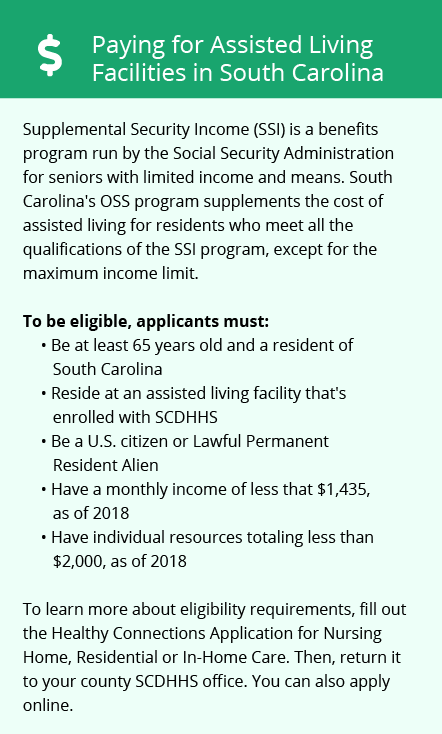 The Community Choices Waiver and South Carolina's supplemental SSI payments can help some senior citizens to pay for part of their assisted living costs. Easley and the surrounding area are home to numerous government agencies and non-profit organizations offering help for seniors searching for or currently residing in an assisted living community. These organizations can also provide assistance in a number of other eldercare services such as geriatric care management, elder law advice, estate planning, finding home care and health and wellness programs. To see a list of free assisted living resources in Easley, please visit our Assisted Living in South Carolina page. Easley-area assisted living communities must adhere to the comprehensive set of state laws and regulations that all assisted living communities in South Carolina are required to follow. Visit our Assisted Living in South Carolina page for more information about these laws.